Welcome to Cloudeight InfoAve Premium issue #807. Thank you very much for subscribing and for being a part of our Cloudeight family. We appreciate your friendship and support very much! Emsisoft One-Year License with Free Cloudeight Installation, Setup & MORE! Some of you are still not using Emsisoft. So, today, we're making you an offer you can't refuse! If you're not yet using Emsisoft, here's your chance to get the best protection you can buy and we'll install it and set it up for you FREE. Removal of your current antivirus. Isn't it time you switched to Emsisoft? Hi Darcy, Thank you so much for getting up so early to work on my computer here in Australia. It was amazing watching you fly around my computer. It was just like having you right here with me. You fixed every one of my problems. I was so impressed, I just bought one of your Senior Passes. Thanks again so much! TC visited my computer this week! You were the nicest visitor I had in long time. Not only was he friendly and funny, he fixed all my computer problems (and there were many) in just about an hour. It was a great experience. If anyone ever has any qualms about having Darcy or TC visit their computer, relax. Great service! My computer is finally running like I want it to run. . Thank You so much! Kathy M.
I just want to shout out to TC. After my computer crashed several weeks ago I could not get anything to work. TC fixed everything that was wrong and more. I had needed 3 different browsers to play a game. I have been playing several years. When he finished I am able to use Google Chrome for everything. Thank you so very much TC. A big Cloudeight "Thank you!" to Don, Dana, Kathy, Pearl and everyone who took time out to write to us. We appreciate your kind words and your support very much! EB & TC. Is Windows 10 ever going to be stable? I feel like I’m always reading there are so many problems with it and that’s the main reason I’m still using Windows 7. When the time comes, I guess I’ll have to switch. Right now, I’m using Win 7 Pro, and based on that, I was wondering what version of Windows 10 you would recommend? Thanks so much! Hi Barb. It's just human nature for the most part. People who are satisfied are notoriously silent. Those who have problems tend to make up for the silence of the majority. There are about 800 million users of Windows 10 – so even if only 1% (8 million) of them are having problems, that's still a significant number of people. and they're going to be vocal. They’re going to drown out the silence of those who have no problems or only minor problems with Windows 10. We can tell you from experience, Windows 10, for the most part, is more stable than any previous version of Windows 10. People look back with nostalgic reflection on Windows XP, but we have been repairing computers for a long time, and we can tell you that Windows XP, while far better than its predecessors (Windows 95, Windows 98, Windows 98SE, Windows ME), also had its share of problems. And Windows 7 had many flaws too. In fact, we can remember when the end-of-life for Windows XP came, many people were complaining about Windows 7. Windows is ever going to be perfect, but Windows 10 is far better than some would have you to believe. If you’re using Windows 7 Pro you will get Windows 10 Pro free when you follow the instructions on this page and upgrade (free) from Windows 7 to Windows 10. If your computer is too old to upgrade, the upgrade will fail and you'll be left with what you have now. And if you find you can't upgrade, you’ll save about $100 by purchasing a computer with Windows 10 Home vs. Windows 10 Pro. We know it’s hard not to hear the naysayers, they make a lot of noise.. But Darcy and I have been fixing computers for a long time and we think Windows10 is the best Windows yet. Still, it’s certainly not perfect. Hi. Ever since the 1809 update, my computer won’t show the pictures in a folder. I tried making changing my settings but I still can't see pictures in folders. All I get are icons. Please help! Hi Bennie. You'll be happy to know it's an easy fix. Open-File Explorer (Windows key + E).Next, Click on “View”, click on Options > "Change folder and search options". 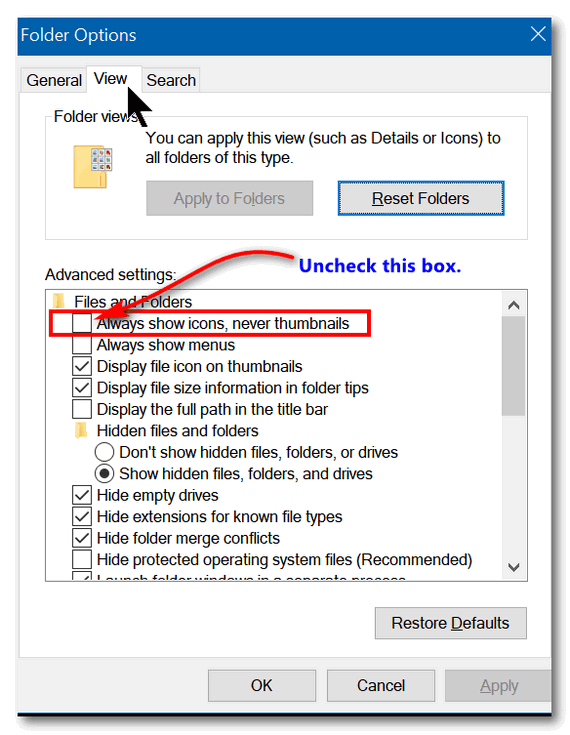 In "Change folder and search options", click the "View" tab and uncheck “Always show icons, never thumbnails”. The pictures in folders will now display as pictures (thumbnails). Bennie wrote back: "Thank you! Thank you! I thought the update messed up my computer! Bennie"
Hi Artie. We wrote an article showing how to install Windows Live Photo Gallery on Windows 10. You can read that article here. That article will tell you everything you need to know about installing Photo Gallery on Windows 10. But...keep in mind, any future version updates of Windows 10 could cause Photo Gallery to stop working. There's no guarantee that Photo Gallery will continue to work in Windows 10 as Windows 10 evolves. As long as you are aware of that caveat, you should be OK for now. Additionally, Windows 10 comes with a app called Photos. It works really well if you're looking for a program to organize your photos. It's in your Windows 10 start menu, listed as "Photos". You can create videos with it and more. We covered Windows Photos app in this article. You may be surprised at all it can do. If you ever have question about Windows, try our InfoAve site search. Just go visit our InfoAve Website and use the search box that appears on every page. There are over 4000 Windows tips there and a lot of Windows information. Hope this helps you, Artie. In all the decades I have been a fan, never remember seeing this problem. But sometimes I forget, and sometimes I get busy and barely skim over the newsletter (she said sheepishly). So here is what has been a thorn in my side forever. On websites that want to assign a store location for me, i.e. Ace Hardware, Grocery Stores, Kmart, Walmart, etc., I find a default location assigned to me which is NEVER near me, most times it assigns a "store near me" in a town I never heard of. AND rarely the same location twice! It seems to confuse my ISPs hundreds of rural locations as being my own. Chrome is my browser of choice. Is there any way I can change a setting in Chrome, Google or Windows 10 to have my default location have some meaning/realism? Hi Donna. Thanks so much for your support and your nice comments. I don't believe we've ever had this question before. Web sites get your location from your IP address. The IP address your browser broadcasts to web sites is assigned by your Internet Service Provider. Your ISP's street address may be in a big city, but it may have data centers in small towns near its physical location. So, there is nothing you can do about this and nothing your provider can do about this either. Most websites that need a location (like the sites you mention) will also have a place to enter your zip code. I have looked at Walmart, Ace Hardware, and Kroger and all of them allow you to manually change your location. Walmart's method is pretty straightforward. 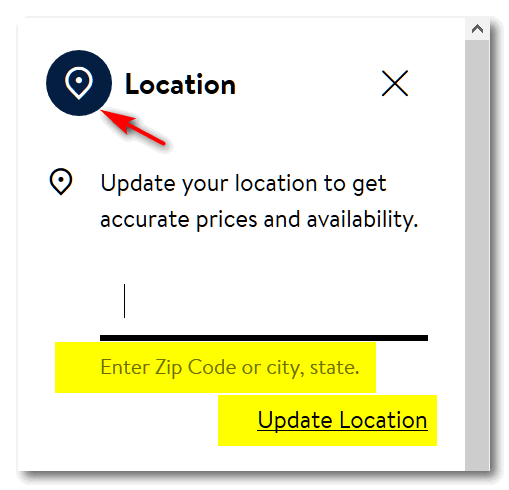 Just click on the location icon that shows near the top right part of the web site and fill in your zip code (or city / state) and click "Update location". Every site is different. 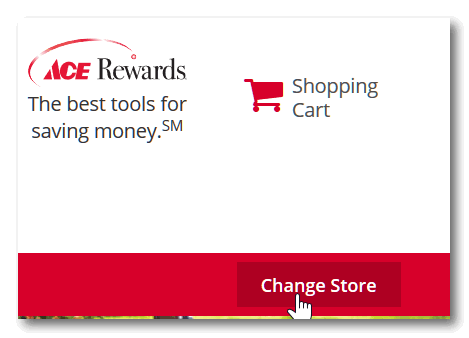 Ace Hardware does it a different way. 2. Type in your zip code or city/state. My IP address generally shows my city and state, but once a while it shows me out in the boondocks in some township I've never heard of. Just so you know this is not a problem you can fix - it's not a problem with Chrome. There is no way you can set your IP address in Chrome. You can try Incognito mode and that way your location should not be automatically shown to the web site (but sometimes it is anyway). But it's much easier just to type your city/state or zip so the web site can give you accurate info for your location. Thanks again for your kind words and your support. Have a problem and was wondering if you can help me with it. I keep getting this pop up bottom right corner of my screen and it says: Your Gmail settings are out of date. What do I do? Hi Audrey. Where are you seeing this notification? At the bottom right of your browser (Chrome, Firefox, Edge, etc.) or in Windows by the clock? Windows tries to sync Gmail and Google calendar, especially if you have set up Gmail in Windows 10's mail app. 4. Under "Notifications", under "Get notifications from apps and other senders" turn the switch to "Off"
Audrey wrote back: "Just to let you know that you have got the magic touch with your knowledge re computers, you fixed mine up and working like a charm, other than this little item I asked you about and so far it has not appeared since. Love you Angels of mine, again cannot thank you so much. I will keep a copy of this just in case it happens again as I will not remember what I did. Keep doing what you do as there are a lot of us out there that do not have a clue what to do as I did." I have Windows 7 Pro, but not sure if it's too old to upgrade to 10. How can I tell? Also, would the upgrade to 10 be Pro version, not that I care. :) Just curious. Hi Jill. If you have Windows 7 Pro you would automatically be upgraded to Windows 10 Pro. There's no really 100% certain way to tell if your computer can run Windows 10 other than trying to install the Windows 10 upgrade. If your computer won't support Windows 10, the upgrade will roll back and you'll be back to where you are now with Windows 7. As always, we always advise you to error on the side of caution. Before you start, make a backup of your important files, just in case. I have a newer ASUS computer and a Dell that is almost 7 years old. I upgraded the Dell computer from Windows 7 to Windows 10. I can tell you after having Windows 10 installed on the Dell for about 4 months now, that the 7-year-old laptop runs better with Windows 10 on it than it ever did with Windows 7. And it's faster and runs better than my 3-year-old Asus as well. Here's our article on doing the free upgrade from Windows 7 to Windows 10. Hope this helps you, Jill. Is it possible to have 2 Gmail accounts. I need another email address and am not sure where to proceed to. Is there a better free email program than Gmail? Hi Connie. Yes, you can create more then one Gmail account. We both have several Gmail accounts. We set them all up in Thunderbird so we can see them all at one place. We still think Gmail is great. We still have not found anything better. Have you ever installed, uninstalled, or updated a program and it says you must restart your computer? Well, if you have, here’s a simple tip to save you time the next time you are in that situation. Instead of restarting your computer, try signing out and signing back in again. Many times it will work if you’ve installed, uninstalled, or updated a program. It won’t work with all programs and it does not work with Windows update, but it does work most of the time. When you restart your computer, Windows shuts down all running programs, all open user accounts, turns your computer off and starts it again. When you sign out of your user account, Windows shuts down your user account only. The machine itself will remain powered on and will revert back to the lock screen (log in screen) for the next time you or another user on your PC (if any) logs in. Signing out and then signing back in, generally takes less time than restarting. Next time you install, uninstall or update a program that tells you that you must restart your computer, try signing out and then signing back in. Many times it is all you need to do and it will save you time. Remember, this will not work all the time, but it works most of the time when a program you are installing or uninstalling (or updating) tells you that you must restart your computer. 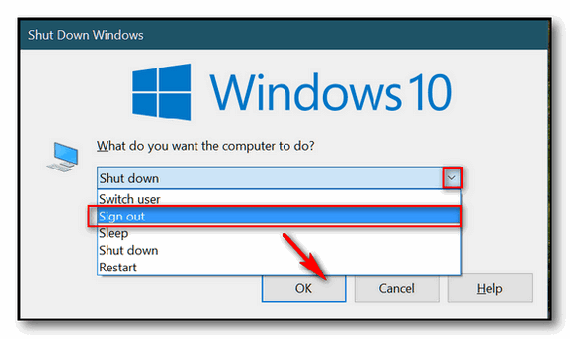 It's been a long time since we've posted a list of Windows 10 shortcuts. We love shortcuts -they're time savers. So we thought it was time we gave you a list of our personal favorites. Shortcuts save you time, but only if you remember them. And you'll only remember the ones you use. Windows Key + i and Windows Key + x are two that you should be using a lot. So you should remember them! Windows Key + X opens the so-called power menu (the same menu that you'll see if right-click the start button), and Windows Key + i opens Settings. Here are some Windows 10 shortcuts we think you'll find useful - some more than others, of course. These are the ones we use most often; we hope they will save you time too! The more you use a shortcut, the easier it is to remember. So try using keyboard shortcuts as often as you can. And remember, in Windows there are most always several ways to accomplish the same thing. Note: In the tip below we use Winkey to represent the Windows Key. The Windows Key is the key with the Windows logo on it, usually located on the bottom row of your keyboard just to the right of the Ctrl key or the second key to the right of the Ctrl key. The exact location varies with computer manufacturer, keyboards, laptops, desktops, etc. Winkey + G Activates Xbox game bar to let you record games or take screenshots. Winkey + Shift + Left or Right Move apps from one monitor to another. The address bar of the browser is where the URL or Web site address shows in your browser. Google’s address bar is also called the Omnibox. But it’s just not for URLs. Here are some of the things you can do with Google Chrome’s Omnibox. You don’t need any third-party programs to track a package from UPS, FedEx, USPS, or DHL. All you need is Chrome and a tracking number. Just copy the tracking number and paste it into Chrome’s Omnibox. Once you do, you’re tracking your package. Did you know you can highlight a word or a phase and drag it to the Omnibox to search or define it? You can and it’s easy to do. Highlight any word or phrase from whatever you’re reading and drag and drop it into Google’s Omnibox and then press Enter to begin the search. You can also highlight a word or phrase, right-click it and choose “Search Google for [word or phrase].” A Google search will appear in a new tab. If you’re on a web site and want to do a search without navigating away from the Web site you’re viewing, type in your search query in the Omnibox, hold down the ALT key and press Enter. Voila! Your search query will open in a brand new Chrome tab. If you find an interesting Web site that you’d like to come back to later or refer to often, you know that you need to bookmark it. Did you know you can highlight the site’s URL showing in the Omnibox and drag it to your bookmarks bar? you will want continual and easy access to, highlight the URL and drag it to the Bookmarks Bar. Also, you can also drag links from any web page directly into your Chrome Bookmarks Bar. Want some bonus tips? See this tip online. The bonus tips are at the bottom of the article! Please help us by making a donation right now. Thank you! Windows Disk Cleanup has been around since Windows 95. It’s been the venerable disk cleanup that many people have used for years. You can still run it in Windows 10 through version 1903 by typing CLEANMGR.EXE in taskbar search and pressing Enter. However, nothing lasts forever. Microsoft is retiring Windows Disk Cleanup and replacing it with Storage Sense. You can read more about that here. 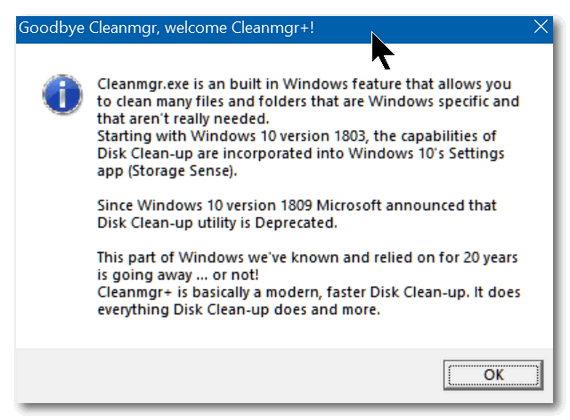 One developer says – not so fast there Microsoft, and has taken Windows Disk Cleanup, modernized it a bit, added a few new features and renamed it Cleanmgr +. Cleanmgr+ is available free to anyone who wants it. So, those who do not like Storage Sense, or who miss Disk Cleanup have an alternative that’s very much like Windows Disk Cleanup only updated and with more features. For a more thorough clean-up, please run Cleanmgr+ as Administrator, i.e. 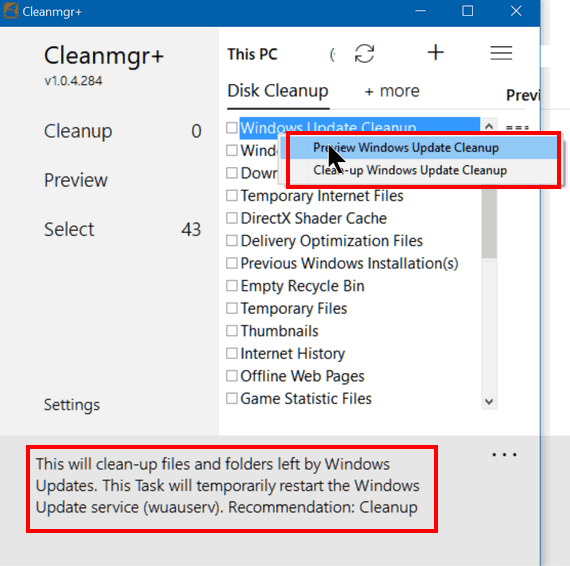 for a Windows update cleanup, the Windows update service needs to be stopped and restarted by Cleanmgr+ Therefore administrative privileges are required. Windows SmartScreen, Google Chrome and some other antivirus engines may warn you from downloading this program. This is caused to the small user base. Sadly I can’t change anything about that. Cleanmgr+ is currently seven weeks old. I’m working with AV vendors and requests for whitelisting are in progress. Please report these false positive messages also to your AV vendor to speed up the process..."
Indeed, we feel his pain. When we tested Cleanmgr+ the only thing that balked at it was Windows Smart Screen, which we refer to sometimes as DumbScreen. 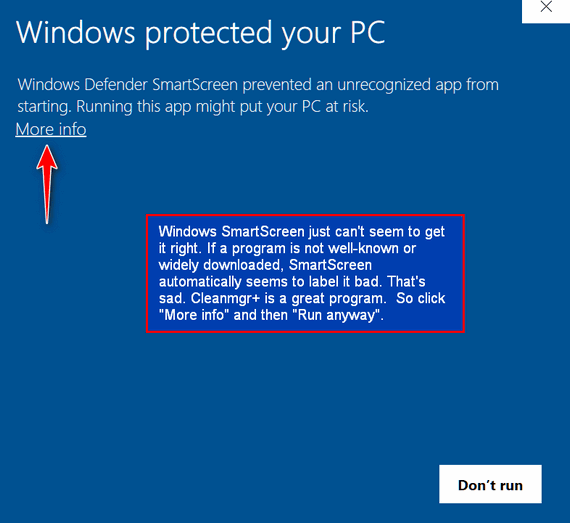 It’s too bad that Microsoft can’t fix Windows SmartScreen so it actually lives up to its name. Just because a program is not widely downloaded, comes from an obscure developer, or is new, does not make the program dangerous or bad. When we saw that Cleanmgr+ raised the ire of SmartScreen we almost decided not to feature it. But that would not be fair to the developer or to anyone looking for a long-range replacement for the soon-to-be-retired Windows Disk Cleanup. And it’s scary, but do not fear. 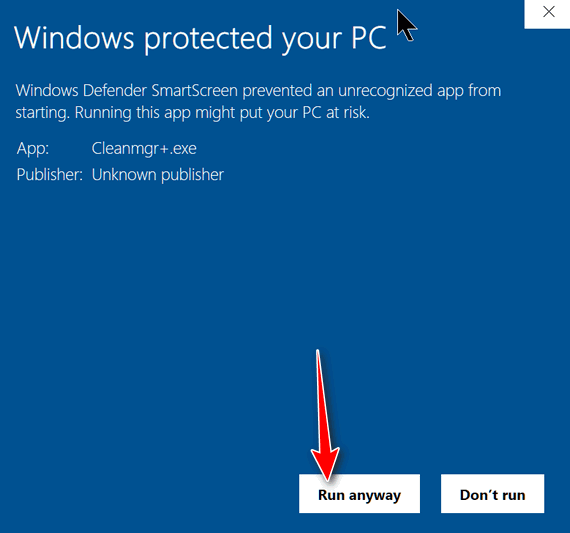 Don’t let Windows SmartScreen keep you from using a really nice program. Click “More info” then click “Run anyway”. Cleanmgr+ does not install. It comes as a zip file. Just unzip it and run the exe file – no installation required. We suggest when you do unzip it, that you right-click on the exe file and choose “Pin to Start” so you can run whenever you want to. 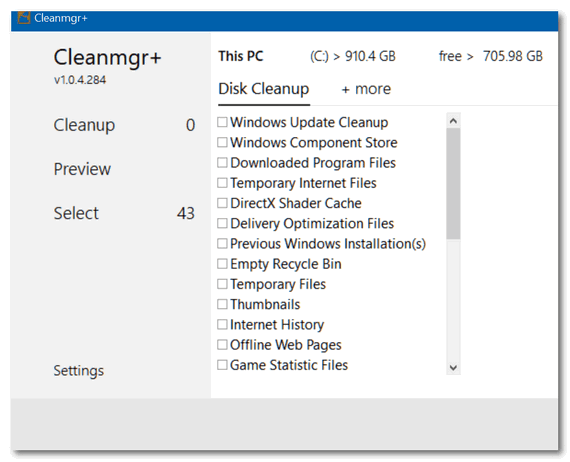 Cleanmgr+ has all the familiar features of Windows Disk Cleanup and then some. One of the nicest things about Cleanmgr+ is that you can choose any of the options and get a simple definition of what it does. And another nice feature is that you can preview your cleanup before you actually run it. About the only area where users could get themselves in trouble is by clicking the box next to “Previous Windows installations”. If you upgrade to a newer version of Windows 10, the previous installation gives you the option to go back to the previous version of Windows. So, caution is needed here. If you install a new version of Windows 10 and you’re sure all is well, you can remove the previous Windows installation. Keep in mind too, Windows will automatically remove the previous installation after 10 days. 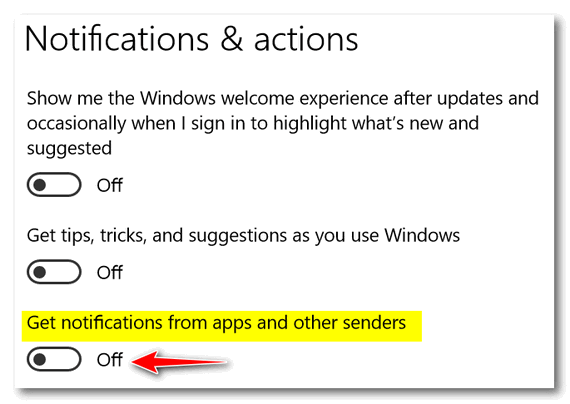 So, we recommend you leave that box next to “Previous Windows installations, unchecked. Above: Choose any option and you’ll find out what it does. Notice you can run Cleanmgr+ in preview mode to see exactly what is being cleaned up. Running Cleanmgr+ in my test run cleared up 2.44 GB of space. Windows Disk Cleanup will soon be retired, but you now have an option. Learn more about Cleanmgr+ and/or download it here. We are proud to be associated with Emsisoft and to be an authorized reseller for them. One of the best things about working with Emsisoft, is working with people like Daviat and the rest of the Emsisoft team. Not only is Emsisoft Anti-Malware a top-of-the-line antivirus and Anti-Malware program, the support provided by the Emsisoft team is unsurpassed. Recently Daviat, knowing that we and many of our subscribers are older folks, passed this article along to us and asked us if we’d like to share it with you. It’s a really good article. It first appeared on the Emsisoft Blog and was written by freelance writer, Vincent, from New Zealand. We hope you enjoy today's guest essay. Albert is 69 years old. Last Christmas, Albert’s 39-year-old son bought him a tablet with touch-screen display, thinking it might prompt him to go online and read the news. After all, Albert loves the idea of getting news and checking the weather forecast at any time of day. Albert’s son had high hopes for his father’s new tablet: He imagines he might even be able to share with Albert some of the inspiring articles he finds online. Who knows, they might even cheer up Albert and give father and son more to talk about? To Albert, his learning curve seems very steep: Whether it’s real or imagined, Albert is deeply intimidated by the internet. He has heard stories about dangers lurking in the online world, and he’s afraid he might fall prey to an online scam. Albert consoles himself with the thought that he’s probably not missing out on much more than nonsense memes and a collection of cat pictures. After all, the Internet might just be a waste of time. Is the internet simply another place to waste time on silly cat pictures? Do you think Albert’s 39-year-old son understand his father’s fear of the Internet and why he can’t simply ‘get over it’? The author can attest: His son (me), has little or no understanding of why his father won’t switch on the tablet and experiment with it. However, having researched and written this article, the author has gained a new feeling for the many reasons senior citizens might hold themselves back from embracing the internet. Let’s uncover why senior citizens like Albert are fearful of venturing online, and why, a few seniors have embraced the world of opportunities available to them online, and could never turn back to a life offline. Read the rest of this guest essay here. The Beatles had only 4 members. If they stood side-by-side, the whole group was only measured 11 feet wide. But Blood, Sweat & Tears had 9 members and standing side-by-side they measured 25.5 feet wide. Blood, Sweat & Tears was wider than The Beatles. They had more width... more bandwidth than The Beatles, but The Beatles sold tons more records. So, bandwidth does not mean a thing. Wait! Wait! Yes it does! According to the official definition: "Bandwidth is a term used to describe how much information can be transmitted over a connection. Bandwidth is usually given as bits per second, or as some larger denomination of bits, such as Megabits per second, expressed as Kbit/s or Mbit/s. Bandwidth is a gross measurement, taking the total amount of data transferred in a given period of time as a rate, without taking into consideration the quality of the signal itself." According to us - If you have a swimming pool containing 50,000 gallons of water and you try to drain it with a garden hose, it will take you about 17 days to drain (or download) all the water out of that pool. Now if you have a fire hose - i.e. a big thick pipe, you can drain (download) the water in about 2 days. So the fire hose has more bandwidth than the garden hose? See? The bigger the hose the more water flows through it and the faster the water flows through it. Just think about it for a minute.